The Expand Skills section will help you learn about ways to expand your skills. One of the best ways can be through education and training. In this section you'll see some education options that help you expand skills. You'll see benefits for going to school. Also, you'll learn some tips to find the right education for you. What skills should you gain or expand? Your skills are the foundation of your career. You've learned about your personal skills such as managing your personal life. You know the skills to be successful in the new world of work. You've assessed your work skills. You've explored careers to find out the skills needed for careers. Hopefully, you put any skills you need on your career plan. 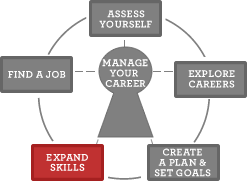 This section helps you put all of these skills together and to implement your career plan. Why should you expand your skills? Are you looking for a new or better job? Employers hire people with skills that match their job needs. Employers keep and promote people who are serious about expanding their skills. Many good jobs require training such as a degree or a certification. If your job ends, you’ll have a better chance to get a new one. Assess your skills, interests, and work values. Then you'll make better decisions about expanding your skills. Expanding your skills will help you advance your career or look for a job. Be prepared to Find a Job. You’ll be better able to be successful if you Set Goals.